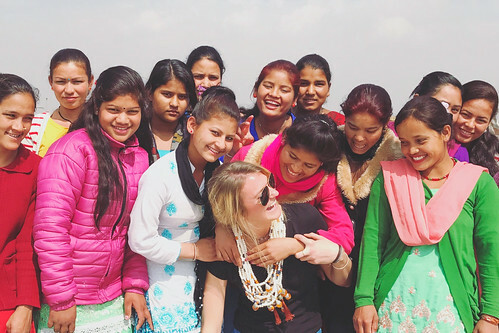 Photo: The girls at our Nepal ‘She Has Hope’ rehabilitation home enjoyed learning how to make over 400 handmade necklaces with guest teacher Lindsey. March 3, 2017. We are happy to report that on February 18th, a volunteer traveled from Houston, Texas, to visit the new group of girls currently living at our ‘She Has Hope’ rehabilitation home in Nepal. Lindsey, who is a jewelry designer, had previously visited the rehabilitation home with another volunteer in July 2016. During this trip, Lindsey taught the girls how to make long beaded necklaces with a bead crimp locking technique, stretch bracelets, and handmade tassels. They used variations of bone, wood, amber, turquoise, and clay beads which Lindsey purchased from various local market shops. In addition, she sourced many different silver pendants, silver lockets, and crosses from the local markets. However, pendants are often limited and hard to come by in Nepal, so Lindsey taught the girls a very creative technique of taking ornate beads and dangling a tassel through them, turning them into pendants. Lindsey loved that the girls were so eager to learn and would continue to practice a technique until they understood how to do it correctly. She said, “All of the girls are very bright and worked patiently with me.” The girls completed over 400 handmade creations which gave them a great sense of accomplishment and self-worth. Lindsey also encouraged the girls by getting to know them on a personal level through fun recreational activities. She taught them how to do yoga to prepare their minds and bodies for each work day, and to loosen up their shoulders, backs, necks, and hips after long sessions of jewelry-making or sewing. Lindsey also taught the girls how to line dance to country music, and how to swing dance with a partner. In return, the girls taught Lindsey how dance to Nepali music — the girls sang their favorite Nepalese songs to her while they danced in a circle. Lindsey reported, “We spent the majority of our time together on the floor beading and learning from one another. They would teach me Nepalese and I would teach them English. There may be a big language barrier, but we all understood the universal language of love. The Nepalese word ‘maya’ (love) could never be overused at our rehabilitation home.” Even with all of the hardships the girls have been through, they still have it within them to encourage one another. Lindsey noticed that if one of the girls did not make a necklace correctly, another girl would help her figure out the mistake — the girls were extremely compassionate, helpful, and patient with each other. In other news, our native Nepal team recently organized a trafficking avoidance counseling class for 53 teenage girls in the local schools. The girls were taught the importance of knowing the people around them in various situations; informing their friends and families about the people they spend time with; to use their mobile phone and Facebook account wisely if they have either one (to not share their password with their friends, to not chat with strangers, and to not post online unnecessarily); to be extra aware at all times in case someone is following them and to inform their friends and family of the possibility; and to not be lured by false promises such as marriage, or education and employment opportunities, from strangers. For the past few years, mobile phones have been one of the major mediums for human trafficking in Nepal — the traffickers use mobile phones to reach the girls from remote areas. Thus, our team focuses a lot on teaching these young girls how to use mobile phones with discretion. As always, we are so grateful for your generous donations and your faithful prayers, helping to improve the lives of our girls, our children, and our native team, who faithfully serve in our programs.